How Will Hurricane Florence Affect Venango County and Surrounding Areas? VENANGO CO., Pa. (EYT) – Meteorologists aren’t expecting Hurricane Florence to have much of an effect on western Pennsylvania. 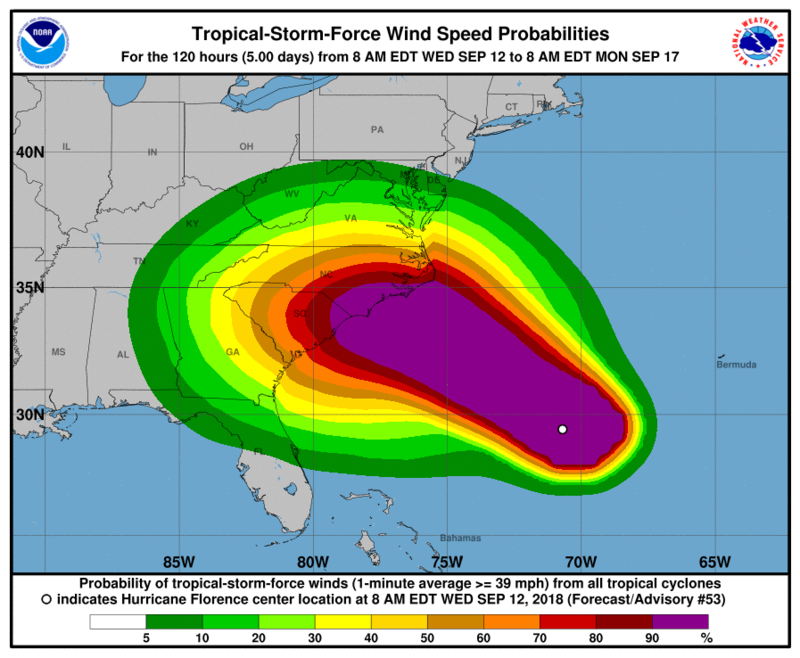 Hurricane Florence is continuing to track toward the Carolina coast, but meteorologists predict that it will take a more southerly path after it makes landfall, which should mean Pennsylvania will be spared from most of the storm’s effects. The storm is then expected to then move in a westward direction, to the south of Pennsylvania. According to the National Hurricane Center, the storm had sustained winds of 130 mph and was moving NW at 15 mph as of Wednesday afternoon. It is expected to deliver tropical-storm-force winds on Carolina’s coast by Noon Thursday, and hurricane-force winds with dangerous storm surges by late Thursday or early Friday. Officials predict that the 150-mile wide hurricane’s circulation could produce life-threatening storm surges of up to 13 feet. The impact of the storm on the Carolina coast is expected to be severe, with torrential rain, high winds, and storm surges, possibly lasting as long as several days from the initial impact. A Storm Surge Warning and a Hurricane Warning are both in effect for South Santee River, South Carolina, to Duck, North Carolina, and; Albemarle and Pamlico Sounds, including the Neuse and Pamlico Rivers. A Storm Surge Watch and a Hurricane Watch are both in effect for Edisto Beach to South Santee River in South Carolina. A Storm Surge Watch and a Tropical Storm Warning are in effect for North of Duck, North Carolina, to the North Carolina/Virginia border, and Tropical Storm Watch is in effect for North of the North Carolina/Virginia border to Cape Charles Light, Virginia, and the Chesapeake Bay south of New Point Comfort. Over one and a quarter million residents in the Carolinas and Virginia, including all residents along South Carolina’s 187-mile coastline, are now under mandatory evacuation orders. State officials in South Carolina have reversed the lanes on four major roads leading to and from the coast for the evacuation. Officials in Virginia are advising residents in the evacuation zone to seek higher ground, reminding them of Hurricane Harvey and the serious flooding that made it one of the most destructive storms in the last decade. Locally, forecasters are expecting any residual effects of the storm passing to the south of Pennsylvania to be minor. Friday’s forecast in Western Pennsylvania calls for a slight chance showers shifting into partly sunny skies with temperatures in the 70s. The favorable weather continues through the weekend with mostly sunny weather expected Saturday and Sunday including temperatures topping out at 80 degrees both days. Some moisture from the storm could make its way to our area next week. The extended forecast shows a chance of showers with temperatures in the 70s on Monday, and showers likely with temperatures in the 70s on Tuesday.